I'm pretty sure older versions didn't have this problem, so I may ditch the looks and just keep the logic of the new one. It could be that what we see ( the distance we see ) and the actual collision detection are two different things. is the dock an untextured model of some sort? i think it is. could the solution be to make the dock box larger? or maybe center it a bit better? I think the docking is related to being in a certain place which initiates the procedure, just like those refueling stations. 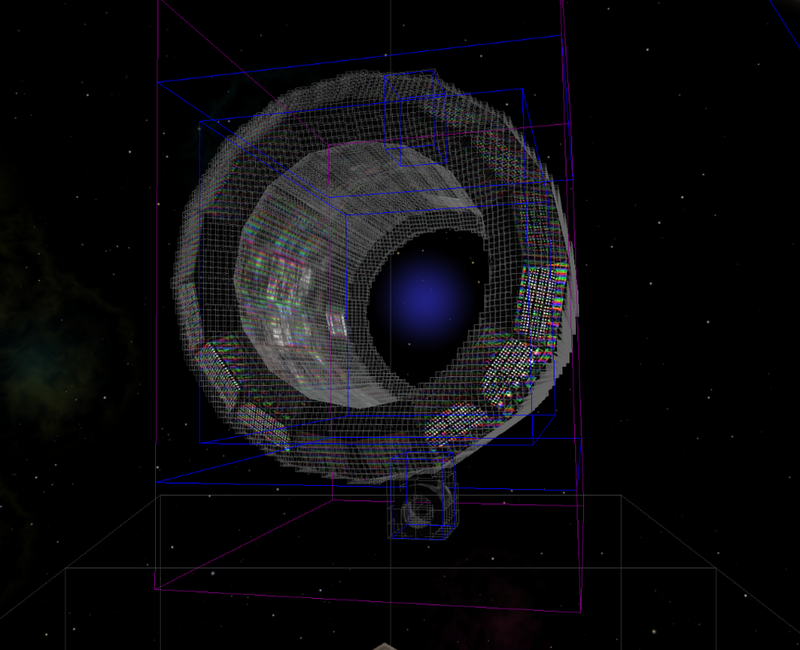 Here is a picture with the actual bounding boxes as per another_commanders code. hmmm, well it doesnt look like there is anything physically there to hinder a ship. Then the most likely explanation is the model's graphics are simply not lined up with where the game thinks the "solid" parts are. Superhub v1.5 OXP does not have this problem. It seems to use the smaller textures and lacks a defined docking port piece. The easist fix would be to scale down the model for the dock along the z-axis (e.g. to a length of 100 instead of 2000). So this is a really stupid question, and maybe off topic. How do I actually get docking clearance approved? Whenever I request it, I always get a denied response. Are you using the Super Hubs for Extra Planets OXZ ?